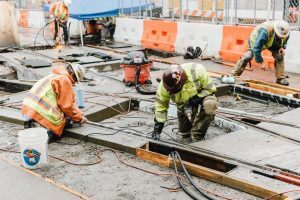 TriMet’s Morrison-Yamhill MAX Improvements project reaches a milestone on Sunday, May 14 as the Portland Streetcar resumes regular service on 11th Avenue. The street remains closed to auto traffic and MAX service remains adjusted through Saturday, May 20 as crews complete track and intersection improvements on SW Morrison and Yamhill streets at 11th and 1st avenues. This work is being done on the oldest section of the MAX system that has been in service more than 30 years and is similar to the improvements made during two projects last year (1st Avenue/Rose Quarter). The switches and special track work at Southwest 11th Avenue connect to what was originally the end of the first ever MAX line, which went into service in 1986. Crews have removed old wooden ties in the 11th Avenue area, put in more durable material, installed new switch machines and track, and worked on drainage improvements. During the final week of the project they’ll be finishing up work on the signal system; replacing broken asphalt, brick and Belgium Block; and preparing the rails to restore MAX service across 11th Avenue. At 1st Avenue, crews have installed new sections of curved rail on Yamhill and Morrison streets. The main work there will wrap up May 16. The projects reflect TriMet’s reinvestment into the MAX system to increase the resiliency of the system and keep trains running on time. 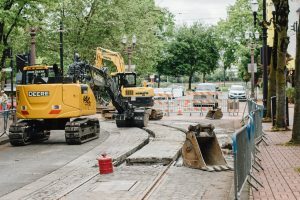 The improvements also will make the ride smoother for our customers and Portland Streetcar riders, as well as benefit pedestrians, cyclists and auto drivers. MAX Blue, Green and Red lines continue to be disrupted and all MAX lines remain on reduced service through Saturday, May 20. We thank our riders who have adjusted their MAX trips to avoid the main commuting hours. We have seen an increase in ridership on our regular service buses since the project started on April 30. We appreciate our riders’ patience and understanding as we complete these necessary upgrades. Riders can get line-by-line details, view animated maps of the service changes and check the special schedules during the project at trimet.org/morrisonyamhill. TriMet is tackling more MAX improvements so riders can better rely on us to get them where they need to go. While MAX on-time performance — our measure of reliability — is increasing, there’s more work to be done to keep trains moving and improve the customer experience. As part of TriMet’s agency-wide efforts to make our transit service better, we are completing a number of upgrades and projects necessary for any light rail system. We know our riders want more and better service. That’s why we’re working to grow our network of buses and trains, ensure the MAX system remains safe and efficient far into the future and improve the overall experience for our riders. TriMet coordinated with Multnomah County, Portland Bureau of Environmental Service and Portland Parks and Recreation to align sewer and other infrastructure repairs to occur during our Morrison-Yamhill MAX Improvements project. 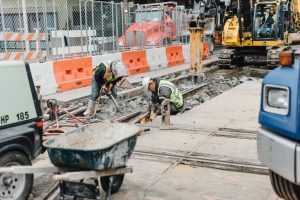 This avoids additional disruptions to MAX service in downtown and is just one example of how local agencies are working together to lessen the impact during what will be a very busy construction season. Learn more at movePDX.net.